We assembled a small survey of a few benchmark wines from the center of the sparkling wine "universe," France's Champagne region to compare with notable bottlings from Italy and California. 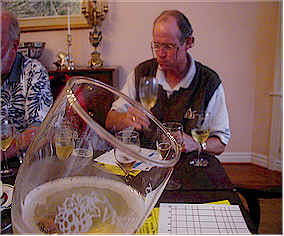 The tasters were impressed by the overall quality of the wines. This was a difficult tasting, as there was not a significant qualitative difference in the field of wines. 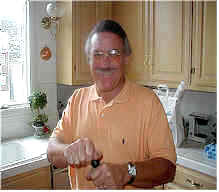 It came down to deciding what style of wine was preferred by a particular taster. As some of our flock were out of town on vacation or retreats, the group was smaller than usual. This created an interesting dynamic whereby 25% of the panelists accounted for more than 50% of a wines' total points. This effectively eliminated this wine from winning the tasting!!! I found this to be a nice, nearly dry, mildly yeasty, lightly toasty bubbly. It displays an apple-like fruit note to go with the toasty elements of the wine. One-and-a-half stars (3 star scale, zero being "standard" or ordinary). Though this had a lightly toasty note on the nose, I found the flavors were somewhat reminiscent of candied fruit which was an odd combination. It didn't strike me as being very dry, either. 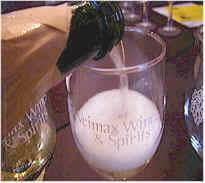 Having shown well in the last Vino-Fino tasting of sparkling wines, we included it this time, too. I found some nice fruit aromas with a creamy note to the nose and mildly toasty scents. It's got a fresh, appley flavor while being soft and creamy on the palate. One star. This wine displayed a nicely yeasty fragrance with hints of fresh bread and some creamy scents. The nose was a shade more complex than the palate, but it was still quite good. One-and-a-half stars. Showing an almost buttery element on the nose, this displays very nice Pinot fruit with a lot of creamy fragrances and a lightly toasty background scent. It is rather rich on the palate, with a hint of a cocoa note in the mouth. The acidity is not especially high, adding a bit of weight or richness. One-and-a-half to two stars. 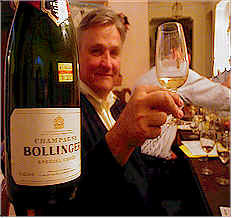 Bollinger, for me, was terrific! The wine is moderately yeasty and bready, with lots of appley notes on the nose. The wine is beautifully balanced, being rather dry and crisper than the California and Italian offerings. Two tasters did not find this as appealing as most of the rest of us had, so the last place votes prevented this wine from winning the tasting. I found a nice yeastiness to the nose of the Gonet Champagne, but marked it down because I didn't care so much for a mushroomy note. It is quite crisp and shows Champagne acidity, with a mild dosage as a counterpoint. One-and-a-half stars. Clicquot had difficulty in maintaining adequate supply during the Millennium madness a couple of years ago. Though the winery denies purchasing Champagne from others, we found their wine at that time to be more fruity and somewhat sweet. With a return to "normal" sales cycles, perhaps Clicquot's current offering has more aging "en tirage" and, possibly, a bit more aging on the cork, too. This is lightly toasty and shows a lovely balance of fruit on the nose. I have a question mark as to its being very dry, but the crisp acidity of Champagne is certainly present. 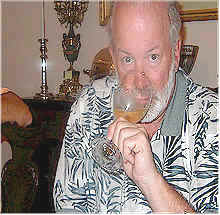 The wine is creamy, mildly tangy and somewhat yeasty on the palate. Two stars.